In October 2017, Jamie and I had the incredible opportunity to attend DevLearn in Las Vegas. 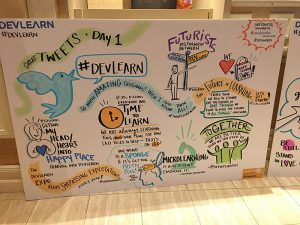 DevLearn is an international conference on learning technologies and focuses on how to develop a top-quality workforce with effective learning and skills development opportunities. Jamie offered two scholarships to OSU Extension staff and after submitting an application, Cindy Folck and Ed Brown were selected to travel to Vegas with us for this amazing adventure. 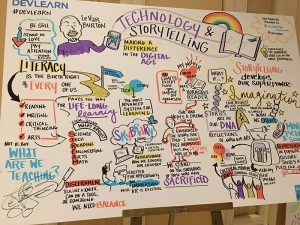 Below is a recap of our collective insights from the conference. 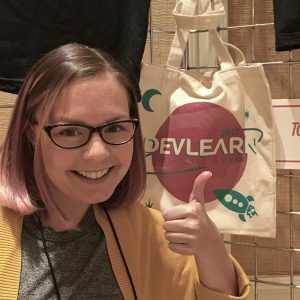 What was the most valuable thing you discovered or learned during DevLearn that you can apply right away? Ed: As a result of attending the conference, immediately after returning to the office, I want back and changed several of my upcoming presentations. I had used these for many years and could now see many ways to improve them. It added a bit in the prep time, but will have long-lasting benefits. Cindy: DevLearn was an opportunity to learn about new technology available for eLearning. I discovered new video enhancement content such as quizzes and bookmarks that I plan to explore to use on upcoming projects. Jamie: That a definite movement toward social learning is gaining momentum – in organizations, businesses, and education. Learning is being redefined, and Extension can gain from adjusting to the needs of those we serve by joining others who are transforming learning experiences, both online and in-person. Danae: The most valuable thing I learned, from a personal perspective, was how to create engaging communities through social leadership. Julian Stodd, with Sea Salt Learning, is a great resource to learn more about social leadership and social organizations. His work emphasizes the need to create communities of trust within organizations. I realized these communities need not be formal, but tend to work most effectively when they are informal and part of people’s natural work or life flow. I’m excited to apply his ideas to creating communities of trust next year! As a result of attending this conference, what is one thing you will quit doing? Ed: I will not immediately pull up my old PowerPoint to make the same presentation that I have made many times before. I will not always use the presentations that are sent to me for statewide topics, but take a look to see if there is a way to way to modify it in order to benefit the learner. 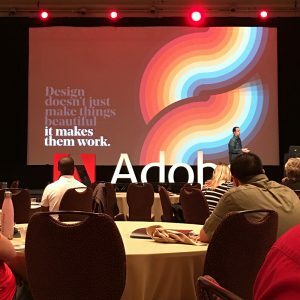 I want to be learner centric, not speaker centric (I want a greater impact). Cindy: I plan to stop waiting to begin evaluations of online and e-Learning. I’ll also stop waiting to create evaluations for static websites. Danae: I will quit thinking that Extension is unique in terms of how we train and develop our staff. Employees in organizations across all industries need the same opportunities for skills and career development. We can learn from the successes of other industries to build an effective learning and development unit within Extension. What were the benefits of attending a non-Extension conference? Ed: It was great see educators from other industries and see how they approach teaching. Cindy: The audience for the DevLearn conference included large corporations conducting employee-training with e-Learning. It was beneficial to hear their struggles with the same issues we experience in Extension. It is empowering to know we are on the frontier of e-Learning with these corporations and their consultants and not a step behind. Jamie: I always try to attend at least one non-Extension conference each year to help me gain new perspectives and connect dots to partnerships with people, companies, and organizations that I may have never thought of before. Every time I attend a non-Extension conference, I realize that no matter how different our fields of study, business model, market, or audience, we often have similar challenges and opportunities and can learn from one another. “Me too!” moments always happen and lead to unique insights. Danae: The single greatest benefit was learning that organizations across all industries are experiencing the same pain points as it relates to employee development. It was also immensely beneficial to learn that there are numerous resources we can tap into without having to recreate the wheel. I highly recommend stepping outside of Extension for an immersive professional development opportunity at least once every few years! Can you share one (or more) resources or programs that you think Extension colleagues would enjoy learning about? Ed: I think that it was important to learn how to think like a futurist. Also, I would like for Extension professionals to learn is that there are other ways to present a topic. Learning something like interactive video or the steps involved in presenting information through an eLearning platform could have the potential to reach traditional and non-traditional audiences in a new way. I am also encouraged to implement augmented reality into my program and hope that it can be implemented around the state. Cindy: The world of analytics is developing and I think Extension needs to become involved with this evaluation tool for our programming. Analytics not only provide feedback, but measures current success and areas need improvement. Jamie: HapYak for creating interactive, experiential videos. Danae: I’ve love for folks to check out the interactive video LIFESAVER for a truly experiential learning opportunity with video. Now imagine teaching people about topics like food safety or safe handling and application of pesticides and fertilizers using this kind of immersive video! If you’re looking for something a bit more whimsical, download the Google Spotlight “Stories” app and watch a few immersive stories. My personal favorites are Duet and Buggy Night. HINT: You’ll want to watch the stories in a space that allows you to move around! Please share a connection or networking contact you think Extension colleagues should follow on Facebook or Twitter. Cindy: The opportunities for webinars and training session through the e-Learning Guild membership is something I’m looking forward to exploring. I think these learning and professional development options would be beneficial for Extension colleagues involved with e-Learning. Danae: I highly recommend following Julian Stodd on Twitter! Julian has written a handful of books on Social Leadership and its importance within organizations. His insights about how to strengthen and develop organizations is simply brilliant. I’m currently reading his Social Leadership Handbook and I’m infatuated! Posted by Danae Wolfe at 10:28am Posted in Ed Tech in Action and tagged DevLearn, Futurist, Learning and Development, Social Leadership. Bookmark the permalink.